Acapulco is the main resort of Mexico on the Pacific coast of the country. Not only residents of Mexico, but also numerous foreigners have a rest in the city. Therefore, Acapulco online webcams are popular all over the world. World tourist publications regularly include the Gulf of Acapulco among the five most beautiful bays of our planet. And Acapulco webcams in real time allow you to see the most beautiful places of this resort, even when you are thousands of miles away from Mexico and when you do not have the opportunity to rest in Acapulco in real life. It is not easy to describe in words the beauty of Acapulco in Mexico. But one look at the resort, even with the help of webcams, is enough to love it. As in the case of Cancun, the main wealth of Acapulco is the magnificent nature. Therefore, most Acapulco webcams are located on the coast of the resort and turned towards the ocean. As a result, we can admire the Gulf of Acapulco in real time from various points of the resort. This is important, because the bay of Acapulco is surrounded by mountains and from different points of the resort offers a completely different view of the coast of the resort. For centuries, Acapulco Bay reliably protected ships from storms in the Pacific Ocean, so today there is a large marina, and with the help of webcams you can see beautiful sailing yachts. 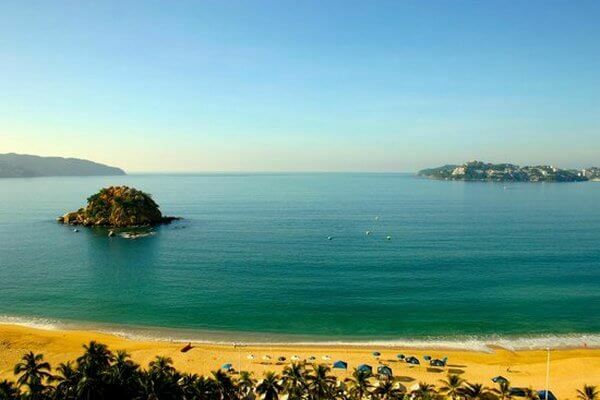 Acapulco’s horseshoe bay is more than 6.5 km wide, and the resort’s coast line is about 18 km long. At the same time on the edges of the bay are surrounded by sharp rocks, and in the central part of the bay there are magnificent beaches of white sand. The length of the beach line of the resort is about 10 km, so a huge number of excellent hotels are located directly on the seafront (ocean) and have their own access to the sandy beach. Almost all webcams are located on the territory of 4-star and 5-star resort hotels, many of which operate on the “All Inclusive” system. Quality and varied food and entertainment is the hallmark of Mexican resorts, and Acapulco is not an exception to the rule. With the help of the resort’s webcams, we can see not only the sea and the main beaches of Acapulco, but also the territory of some hotels – outdoor pools, gardens with exotic plants and palm trees, wide sandy beaches. By tradition, a brief description of the place where this camera is located is added under each of the webcams. The tourist season in Acapulco lasts all year round and daytime temperatures rarely fall below + 30 ℃ даже even in the winter months. Sea temperature at the resort is also very stable. The average annual temperature of water is +25 ℃, and in summer the water in the Pacific Ocean in Acapulco Bay can heat up to + 27 ℃. However, tourists should remember that from June to the end of October there is a rainy season in Acapulco. At this time there can be both strong tropical rainfall and drizzling rain. However, in any case, it may somewhat hinder the rest in Acapulco for those tourists who prefer bright sunny weather and small waves in the ocean. With the Acapulco webcam, you can see the weather in Acapulco online, and it will be more informative than viewing the weather forecast in text or graphic form. Most foreign tourists in Acapulco are residents of North and South America, but there are quite a few visitors from other regions of the planet. 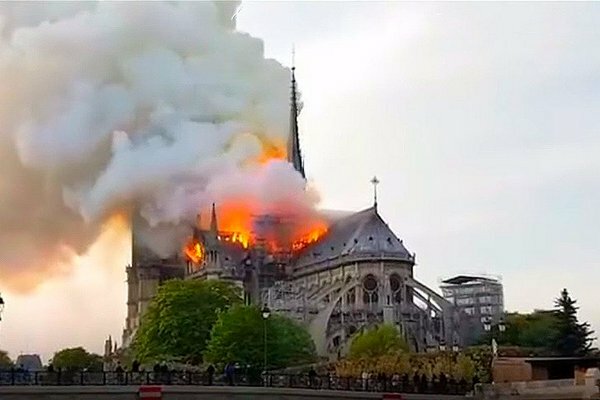 Unfortunately, the long and expensive flight to Mexico does not allow this resort to become popular among residents of Eastern and Western Europe, Asia and Australia. Therefore, for many of this category of people there is the only opportunity to see Acapulco in real time – to view the best webcams of this Mexican resort. Webcams of this city are popular among residents of northern countries, it’s so nice to look at the sun, the warm sea and the green tropical vegetation while the snow lays behind the window of your own apartment, house or office. Acapulco’s individual webcams work with sound and this contributes to an even greater immersion in a virtual trip to Mexico. If you want to make a real trip to Mexico and spend a holiday in Acapulco, webcams allow you to choose the most picturesque area for you of this resort. In addition, if you want to stay in one of the hotels in Acapulco, which houses the webcam, you have an excellent opportunity to see the real infrastructure of the hotel (the number of guests in different months, the width of the beach, the size of the pools, etc.). By the way, you can see the real location of hotels in Acapulco and find out the best prices for accommodation in them using the hotel map below on the page. As with most webcams around the world, the best time to watch Acapulco’s live webcams in Mexico is during daylight hours. A large number of cameras are located on the facades of hotels high above sea level. In such a situation, artificial lighting (if it is available on the territory of hotels) does not allow a detailed view of the situation at the resort at night, although some of the webcams and allow you to make an idea of ​​how this resort looks at night. Therefore, if you live in a different time zone (in Asia, Australia or Europe), do not forget that the time in your country may not coincide with the current time on the west coast of Mexico. To make viewing Acapulco webcams more comfortable, each of the webcams was posted on a separate page. This allows you to quickly select the most favorite webcam from the list and start viewing it. In addition to convenience, this scheme allows you to save Internet traffic and speed up the download of live video from the Acapulco camera that interests you most at the moment. And in a situation where you want to see all the resort cameras added to the site, you can quickly switch between them using the arrow that is located above the playback window of each camera. One of the most interesting live webcams in Acapulco. This resort in Mexico is world famous and is the main resort of the country on its entire lengthy Pacific coast. The first thing you can see with this webcam Acapulco is a large bay surrounded by small mountains. It is these mountains that largely contribute to the fact that the resort for most of the year there is excellent weather. At the same time to relax in Acapulco is best from November to May, when the resort dry season. By the end of May, it becomes very hot, and from June to almost the end of October, the maximum amount of precipitation falls here, i.e. in the indicated months the resort has a rainy season. However, as you can see with the help of this live webcam Acapulco, even in the summer months a lot of sunny days and the color of the water in the ocean is very pleasant, and there are practically no waves. El Morro Beach in Acapulco – live webcam! When you see this Acapulco webcam in real time, you probably want to visit this magnificent beach in Mexico. The location of this webcam is the famous El Morro beach (Playa El Morro). More specifically, the place of installation of the camera is the resort hotel Emporio Acapulco, located on the first line of the ocean beach. Bay of Acapulco is one of the most beautiful in the world, so the view from the Hotel Emporio Acapulco, which is located in the central part of this beach, is one of the best in the entire resort. In the foreground of the webcam, we can see the territory of the hotel with pools and a beach bar. The Emporio Acapulco has several pools, including a pool with panoramic ocean view. When you open the Acapulco webcam page, you will see the most famous beach in the city – Playa Condesa and its scenic surroundings. This place is loved by both foreign tourists, who came to Acapulco in search of a paradise holiday, and the Mexicans themselves, who are especially numerous here at the weekend. Next to Playa Condesa there are luxury four and five star hotels of the city. One of them, Crown Plaza, built in the early 80s. in the form of a ship, and this gorgeous beach takes its origin from it. Playa Condesa stretches for 655 meters along the Pacific coast. It ends behind the Fiesta Americana Acapulco Villas hotel, on the wall of which this webcam is installed. 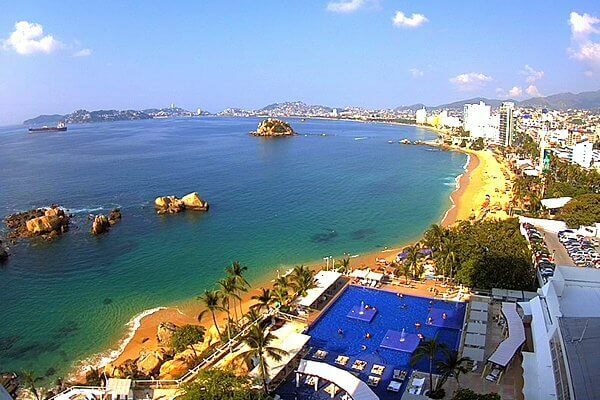 Live webcam Acapulco – Playa Condesa gives you the opportunity to see the beautiful bay of Acapulco in all its glory. 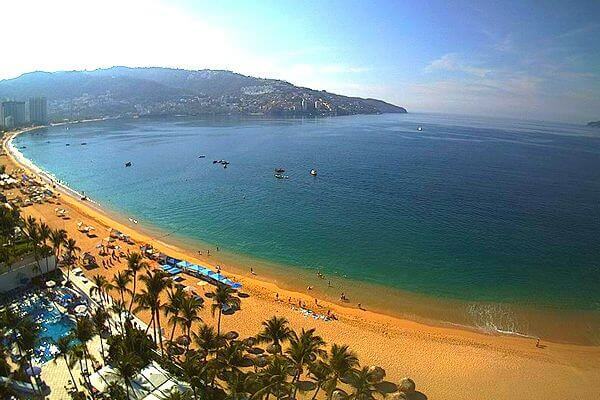 Webcam on one of the most popular beaches in the central part of Acapulco Bay. Ikakos beach has a length of about two kilometers and has a very well-developed infrastructure. In real-time mode, you can see a wide strip of fine yellow sand, on which there are beach chairs, small beach tables and wide soft couch, where you can get a massage. For a small fee, visitors can rent beach umbrellas, which will reliably protect from the bright sun in the middle of the day. For example, renting a beach umbrella will cost only 30 pesos (about 1.5 USD), and a foot massage – just 100 pesos for half an hour (a little more than 5 USD). 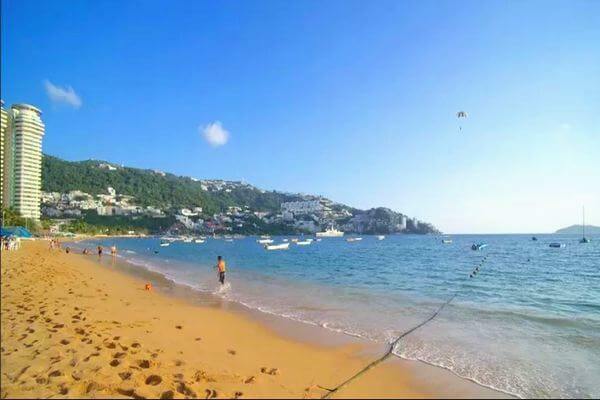 This Acapulco webcam is located on the territory of the beach restaurant La Playita Santa Lucia Beach Club – one of the best places for a beach holiday in the central part of Acapulco. 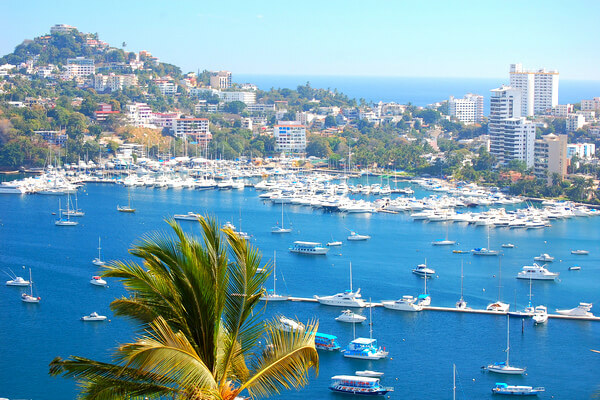 With the help of this webcam Acapulco in real time we can see the western part of the bay where the resort’s main yacht marina is located – Acapulco Yacht Club. This is the oldest yacht club in Mexico, was established in 1955 and even hosted sailing competitions during the 1968 Summer Olympics in Mexico. Until now, this particular place continues to remain the main center of sailing in the country. However, even with the help of this webcam, we can see that not only sailing yachts are parked in Acapulco – many modern luxury motor yachts, owned by wealthy people from different countries of the world. However, it is not at all necessary to be a millionaire in order to ride on a snow-white yacht on the Gulf of Acapulco. A large number of yachts, which you can see in real time, can be rented for a day or several days. 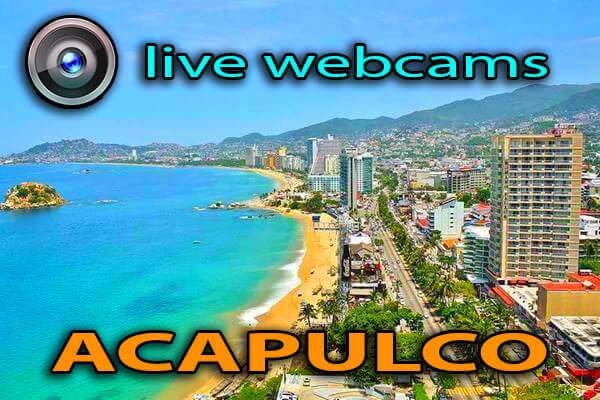 New Acapulco webcams will be added soon!